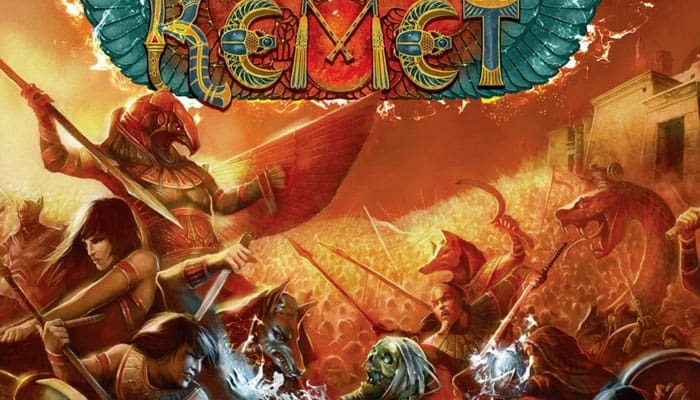 In Kemet, players each deploy the troops of an Egyptian tribe and use the mystical powers of the gods of ancient Egypt - along with their powerful armies - to score points in glorious battles or through invasion of rich territories. A game is typically played to 8 or 10 victory points, which may be accrued through winning attacks, controlling temples, controlling fully-developed pyramids, sacrificing to the gods, and wielding particular magical powers. In the Mythic age of Ancient Egypt, the powerful gods throw their troops into epic battles to demonstrate their power. 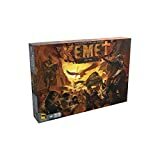 In the desert or at the feet of gigantic temples, they use their many powers to support their troops, summon and control mythological creatures and gain the upper hand. In a game of Kemet, waiting is usually not a winning strategy. One of the most common ways to earn Victory Points is to win a fight as the attacker. This means that it is sometimes appropriate to abandon a position that seems good in order to push your luck and try attacking your opponent. It also means that each one of your troops is a potential target. Q: Can I Control A Creature Away From A Troop? A: No, from the moment a creature is no longer accompanied by at least one unit, it returns to its card, in the player's reserve until the next recruitment. Q: Divine Wound: Can I Discard One Of The Di Cards That I've Played With My Battle Card To Win +1 Strength? Q: Deep Desert Snake: Does The Deep Desert Snake Cancel All The Opponent's Creature Abilities Engaged In Battle?